There’s something comforting about the velvety fatty consistency of perfectly cooked rice and beans. 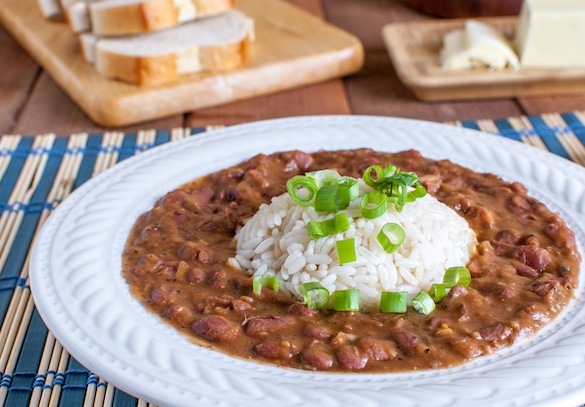 I’ve had many versions in my travels around the world including Puerto Rican Arroz Con Grandules, Korean Kongbap, and Louisiana Creole Red Beans and Rice. Whatever the iteration, they’re all wonderful when properly executed. I know I risk blasphemy when I confess that my gold standard for rice and beans is from the Popeyes fried chicken fast food chain. Not any Popeyes, mind you, but the one in East Los Angeles near where I work located next to the Kaiser Hospital where their high volume turnover keeps the crew on their toes to produce the most consistent fried chicken. Their red beans and rice surpasses all the many other Popeye’s places I’ve tried. And if you don’t believe me, sample it yourself when you’re in the area. The Red Beans and Rice served at the East LA’s Popeyes has the perfect combination of smoky peppery goodness with a Goldilocks combination of rice, beans, and liquid that makes it my favorite side dish to eat with fried chicken. If you’ve tried to make rice and beans yourself, you’ll soon realize, as I did, that it’s not easy to make a superb rendition of this deceptively simple dish. So, when I set out to create the Ultimate BBQ Red Beans and Rice, I asked myself what made my gold standard benchmark so special. 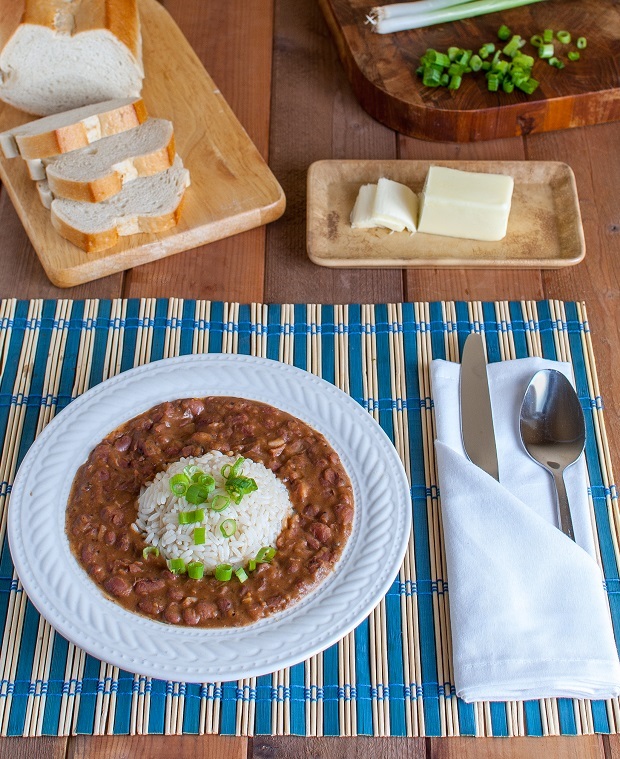 In my opinion, the perfect rice and beans dish should have a combination of whole and crushed beans, flavorful meaty gravy, sufficient smokiness, peppery and cayenne heat, and perfect liquidity and bean consistency. I cook a lot of barbecue, especially pork and brisket, for 10+ hours so tossing a package of Walmart ham hocks and a cast iron pot of beans in my WSM was an effortless no brainer. Voila, when my long haul meats were cooked, I had a tasty side dish ready also. I made some Uncle Ben’s converted rice (out of convenience) and topped it off with sliced scallions. 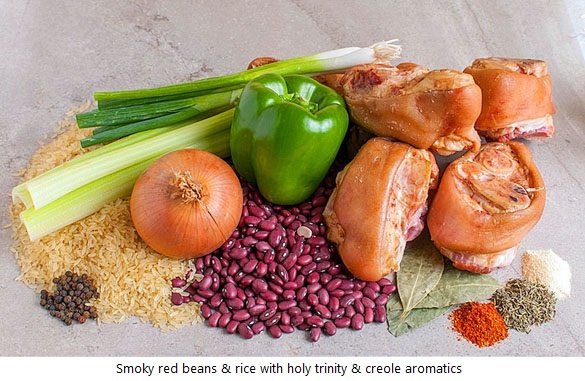 In my Ultimate version, the dish looks much more appealing–more whole beans, subtle visible fragments of holy trinity, and tiny bits of ham hock meat. Smoking the ham hocks again added volumes more smoke which is good as I didn’t want to use liquid smoke which I suspect was in the Popeye's version. 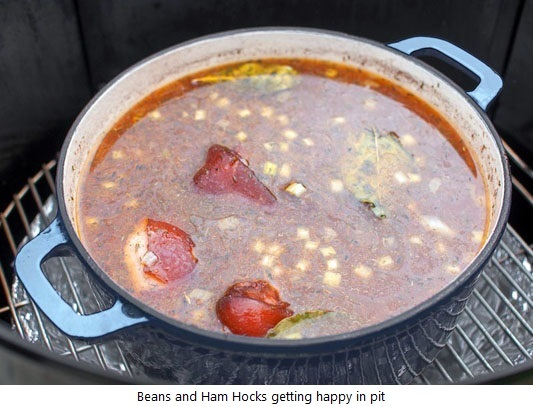 Read on for the recipe details such as how to cook the beans in your pit so that they are not too starchy and not dissolved as much as Popeyes. The key is to cook them just the right amount of time to get the fat and gelatin out of the hocks, evaporate the water, and to get all the starchiness out of the beans, without over cooking them. In my recipe, you actually smoke the water the beans are immersed in so the liquid is smoky – sort of like slow crock pot beans in the pit. 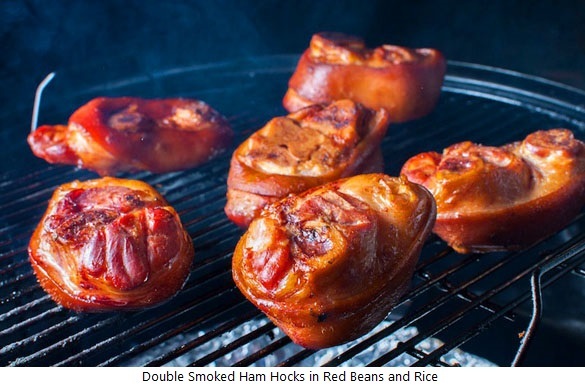 In summary, smoke the ham hocks first and smoke the liquid the beans are in. Take the little nuggets of meat of each ham hock before disposing, mince it up, and disperse it back in with the beans. Soak the beans in plenty of water for 8 hours (or overnight), then drain. In a separate saucepan, saute the Holy Trinity in the lard with 1 teaspoon SYD Hot Rub (or ½ tsp salt) until the mixture is soft, translucent, and slightly caramelized. Turn burner off and mix in the aromatics with the holy trinity. 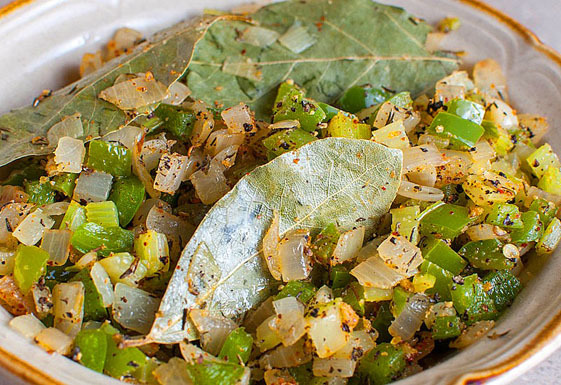 Add the sauteed holy trinity and aromatics to the pot of simmering red beans. Turn stove to high and once boil is achieved again, turn off the burner. After the reserved hocks are cooled down, pick all the meat off the hocks and mince into pieces and reserve. Pull the finished beans out of the smoker and add in the reserved pieces of minced hock meat. Put the beans on the stove on high for just a few minutes, stirring constantly–this will help break up the beans a bit and make a nice velvety consistency. Adjust the thickness of the beans to your liking by either adding a little water if too thick, or reducing it a bit if too watery. When you have your desired consistency, add 2 tbsp of SYD Hot Meat Rub and then salt to taste. Prepare the converted rice by putting the rice, water & butter (and optional minced holy trinity) in a sauce pan and bring to a boil. Reduce to low, cover and steam for 20 minutes. Open and fluff gently with a fork. To serve, ladle in beans into a bowl, then take a tea or coffee cup (8 oz and rounded) and pack in an appropriate amount of cooked converted rice. Then flip the molded rice into the center of the bowl. Garnish with sliced scallions. Enjoy! I was talking about the Popeye’s beans last night with my wife and she looked at me crosseyed when I told her that’s my gold standard too. I’m so trying this at home! Okay Eric, so how did your recipe of red beans and rice turn out?